Binging on Netflix has become a national pastime. But sometimes it’s hard to keep track of what’s really worth watching with your kids. 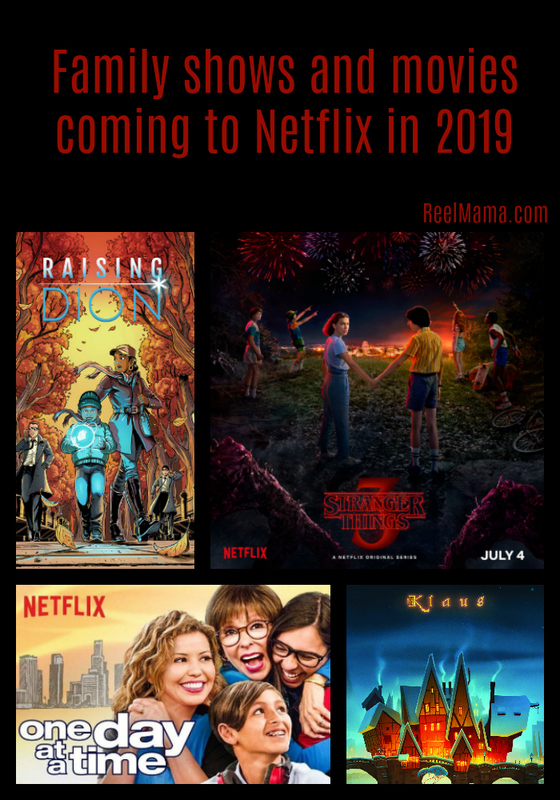 That’s why I decided to create this handy list of original Netflix family movies and shows that are on their way to your small screen in 2019. Some have release dates, and some are still waiting for a release date. My favorite of the bunch is Raising Dion, about a single mom whose son discovers he has superpowers. The biggest question is, how do you raise a superhero? Read on for everything you need to know about the Netflix movies and shows that are on their way, and mark your calendars! The animation is gorgeous and sleek in this new animated series. This isn’t PBS Kids, so it’s a tiny bit edgier, making it better for seven and up. Carmen Sandiego, based on the early 1990s character millennials will remember, is a thief—but it’s all an act for the greater good. Lessons of geography and culture give this show educational value. One Day at a Time is a reboot of an original 1980s series produced by Normal Lear. The Netflix version is funny and fresh, and like most Norman Lear productions, groundbreaking in some way. In this case, we are enjoying the adventures of the Cuban-American Alvarez family. (Since my family is Cuban-American, I can’t help but be thrilled.) It’s all too rare to have a Hispanic family front and center on TV. In addition, teen daughter Elena comes out, and so issues of gender identity and sexuality are front and center. The show also explores mental illness and immigration. Hats off to Netflix for its push to highlight diversity. The Boy Who Harnessed the Wind is based on the true story of 13-year-old William, who wanted nothing more than to go to school. However, William’s family faced drought and starvation in their Malawi village, making an education seem impossible. But William was a dreamer. What if he could use science to save his village, and harness the wind? Also an acclaimed children’s book, The Boy Who Harnessed the Wind is now playing at Sundance. The director is Chiwetel Ejiofor, star of 12 Years a Slave and the voice of Scar in Disney’s live action adaptation of The Lion King. The Chilling Adventures of Sabrina has gotten a lot of flack for some of its wilder content. This ain’t your childhood Sabrina the Teenage Witch. Since there’s a devil worship element and some very racy content, I would only suggest this for older teens. Stranger Things 3, debuting on Netflix on July 4, will bring back its ingenious recreation of the 1980s. This time it’s 1985, when our Stranger Things friends are a little older. Something large and insidious seems to be threatening from the sky, and from the trailer we know one thing: they will be going to the mall. Stranger Things tends to have some edgy content, including language, intense scenes, and the occasional sexual encounter, but it’s okay for 13 and up. “The most important thing about raising a superhero is learning how to become one first.” This is a quote from Dennis Liu’s incredibly cool short film, which he made in tandem with the launch of a new comic series. Obviously a gifted artist and storyteller, Dennis is bringing something truly original to the world of superhero movies and shows in the form of Raising Dion. This new series is the one I’m most excited about: it features a young African American boy who discovers he has superpowers. When I was putting together my list of movies and shows celebrating African American culture, I realized just how few programs are out there featuring boys of color as the main character. Dennis created this series recognizing this. High time! My prediction: kids are going to love binge watching this one. Some of the folks from Disney Pixar are behind this animated series for preschoolers. Go! Go! Smart Wheels toys inspired the series, which explores the childhood of Cory Carson, a kid car who lives out his childhood in Bumperton Hills. With the Pixar pedigree, this show’s animation promises to be strong. Based on the toys, I think we can expect something very colorful with lots of cars zooming around. My 3-year-old son is going to love it. Another preschool series launching this year from India. Mighty Little Bheem features the animated adventures of Bheem, a spirited toddler who explores his hometown. Many times all he wants is a sweet treat called a ladoo. Mighty Little Bheem is a successful franchise in India. With it being completely wordless, any child will be able to enjoy it. How did Santa Claus come to be who he is today? In this unique take on a Santa origin story, one postman is assigned to a Scandinavian town in the boondocks. Nobody writes letters, and he gets the door slammed in his face a lot when he explains to the clueless villagers the concept of a postal service. How can he get people to write letters? He meets a mysterious and very large toymaker, and the rest is history. Which of these Netflix family movies or shows are you looking forward to? Tell me in the comments section! Feel free to pin this image to save as a reminder for when your favorites are coming out!